ATTACKING THE TRACKS. 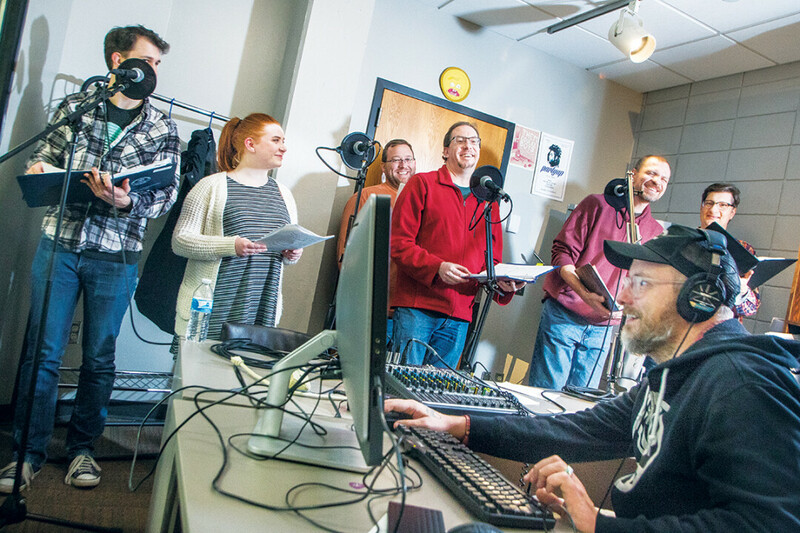 Above: Cast members of Bend in the River record dialogue at the Blugold Radio studios in UWEC’s McIntyre Library. Ken Szymanski, Jim Rybicki, and B.J. Hollars hauled a lectern out of the Volume One Gallery following a live performance of Orson Welles’ War of the Worlds three days before Halloween in 2016. The turnout had been great; people filled the room and stood just outside the gallery door to listen to the actors, who wore authentic 1930s garb, bring the radio drama to life. Now the trio wondered: Could they write and produce a radio drama like this? With the combined efforts of four writers – Szymanski, Rybicki, Hollars, and Charlotte Kupsh – 20 voice actors, Blugold Radio Station Manager Scott Morfit, and two UW-Eau Claire radio production students, that question will be answered in eight episodes of Bend in the River aired on Blugold Radio 99.9 Fridays at 7pm beginning March 23. Hollars “aired” episode one for the first time March 11 for his two children. It was bathtime, right before bed. He turned the lights off for effect, and the mysterious tale of David Sundby, a Wisconsinite who is transported to the summer of 1958 on his way to his grandfather’s funeral, unfolded through laptop speakers, in the eerie glow of the screen. The kids listened even as the bathwater grew cold, begging for the next installment when the words stopped coming. Hollars diverted the duo’s dismay at the suspenseful ending into a lesson on cliffhangers as a literary device. Listeners will have the option of savoring the anticipation of more of Sundby’s story or postponing the experience to binge the series all at once. The producers will make the episodes available on the Blugold Radio website following their on-air run. At 7pm on May 5, the series will conclude with a live dramatic performance of the final two episodes at The Metro, 201 E. Lake St. Ticket purchases will go toward paying the voice actors for their contribution to the project. When Kupsh, a graduate student at UW-Eau Claire, joined the project in November 2016, she didn’t know it would be more than a fun writing exercise. For several months, she collaborated with Hollars, Rybicki, and Szymanski to dream up the series. Sometimes she would work on her own, but she was most invigorated by the time she spent with the other writers, four people in a room with a document up on the screen, writing together. Hollars was inspired by Ray Bradbury’s works. He tried to explore human concerns in a “veiled Eau Claire,” a setting familiar to Chippewa Valley residents, but where characters worried about historic events such as the looming presence of the Russian satellite, Sputnik. Kupsh, meanwhile, focused on writing realistic, believable female characters who spoke to the hardships of being a woman in the late 1950s. Co-writer/director Jim Rybicki reviews the script. When the script was finished in the summer of 2017 and Hollars began talking about finding voice actors, the project became real for Kupsh. “After spending months working on the podcast and having these characters only in our minds and on the page, the experience of hearing actors actually bring those characters to life was incredible,” Kupsh said. The writers had to take great care to ensure the story would be easy to follow, including queues and signals that would keep listeners on track. The plot is conveyed primarily through dialogue. Once the voice actors recorded their parts, it was time to edit. 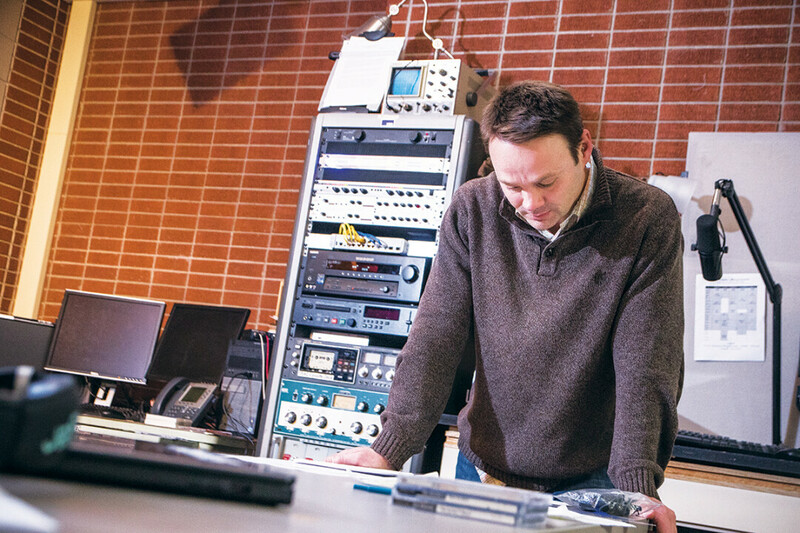 Morfitt worked with two university students, Eli Klatt and Nathan Baughman, to take a cinematic approach to the audio. Scenes are built using music, sound effects, and the dialogue, but Morfitt constantly considered where the “camera” would be in the listener’s mind. The trio determined details down to how long crickets would chirp for, and what direction the noise would be coming from. “A lot of writers kind of spend their lives alone in a room writing words,” Hollars said. This project was meant to break that trend. And it did. Students, professors, children, adults, physicists and more came together to create Bend in the River. “The result was a fully realized world that we care about,” he said. Bend in the River will air at 7pm on Fridays starting March 23 on Blugold Radio 99.9FM and will culminate with a live performance of the final two episodes at 7pm on May 5 at The Metro in downtown Eau Claire.